Sensory Journey | gURROO - A new generation of innovative minds. 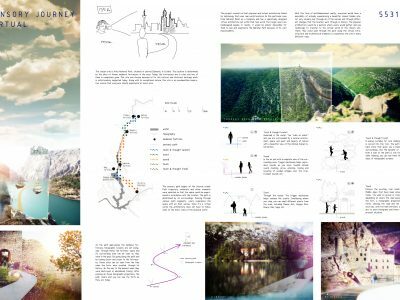 This project consists of both physical and virtual architecture linked by technology that uses real world locations as a template and has a specifically designed virtual architecture set within that real world. The chosen site is Krka National Park, situated in Croatia. The location is determined by the sites of former medieval fortresses in the area. The fortresses are now in ruins and one of them is completely gone. This site was chosen because of its exceptional nature and rich cultural and historical heritage which is unfortunately neglected today. The target users are handicapped people. In reality, it would be almost impossible for them to see and experience the National Park because of its vast inaccessibility. With this form of multidimensional reality, everyone would have a possibility of actually experiencing a beautiful, almost hidden site, not only visually, but through all of the senses and through different changes that the location went through in history (made possible by the virtual infrastructure and architectural elements). 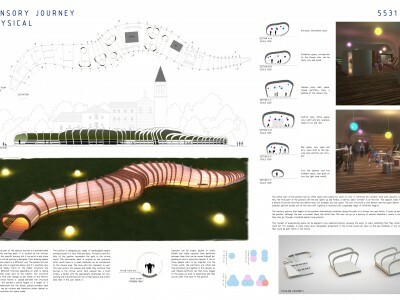 The physical part of the sensory journey is a prefabricated pavilion where users would gather and use technology to transfer to the virtual world. 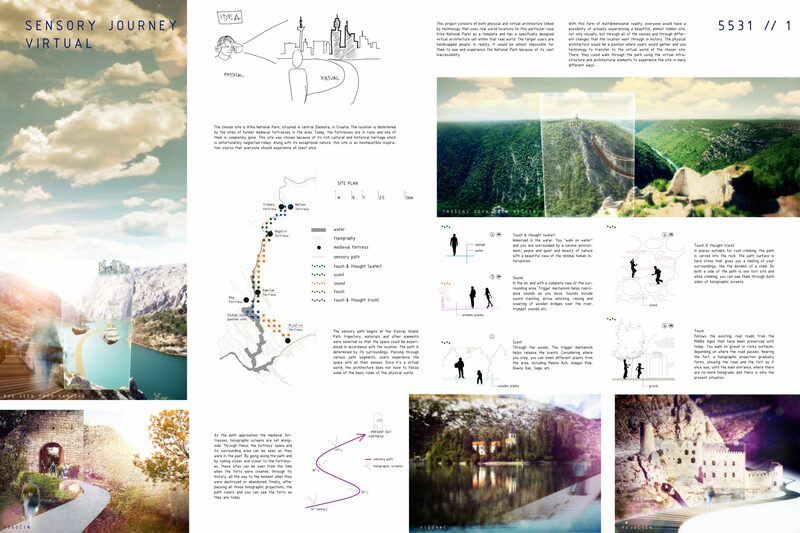 It can exist in any place for which a virtual journey is designed. Tortuosity and fluidity of the pavilion resembles the path designed in the virtual world. 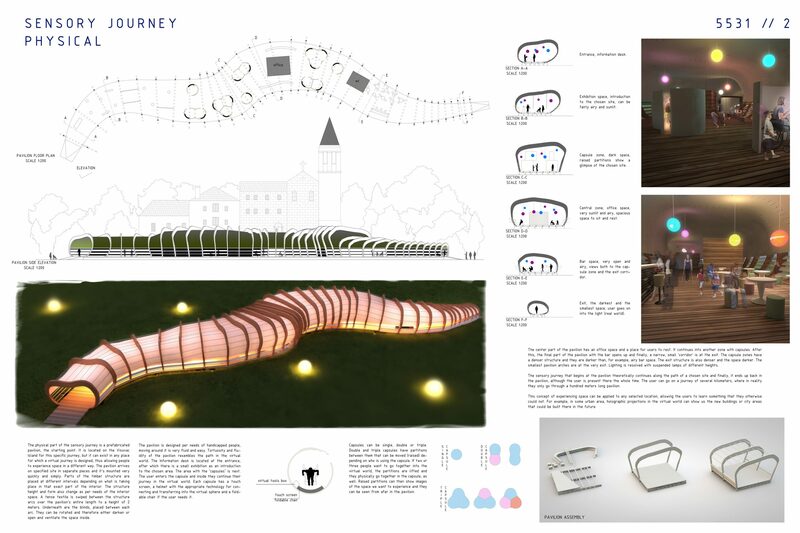 The sensory journey that begins at the pavilion theoretically continues along the path of a chosen site and finally, it ends up back in the pavilion, although the user is present there the whole time. The user can go on a journey of several kilometers, where in reality they only go through a hundred meters long pavilion. This concept of experiencing space can be applied to any selected location, allowing users to learn something that they otherwise could not. For example, in some urban area, holographic projections in the virtual world can show us the new buildings or city areas that could be built there in the future.